Some photos may show optional features. There are many options and features so please check with our staff as they will be happy to assist you. BC Cargo and their Service Providers make every reasonable effort to ensure the accuracy of information on this website. If for any reason the information is not correct BC Cargo and their Service Providers are not responsible for an errors on these pages. Please verify any information in question prior to making a purchase. We understand that sometimes you feel like taking all your toys with you. Enter...the Low Ryder Motorcycle trailer. Elegance and style with an edge the Low Ryder is a premium value trailer that you will be proud to own and show. With the distinctive V-nose, side graphics, smooth exterior, polished aluminum amenities and fully finished interior, trim really set you apart from the crowd. 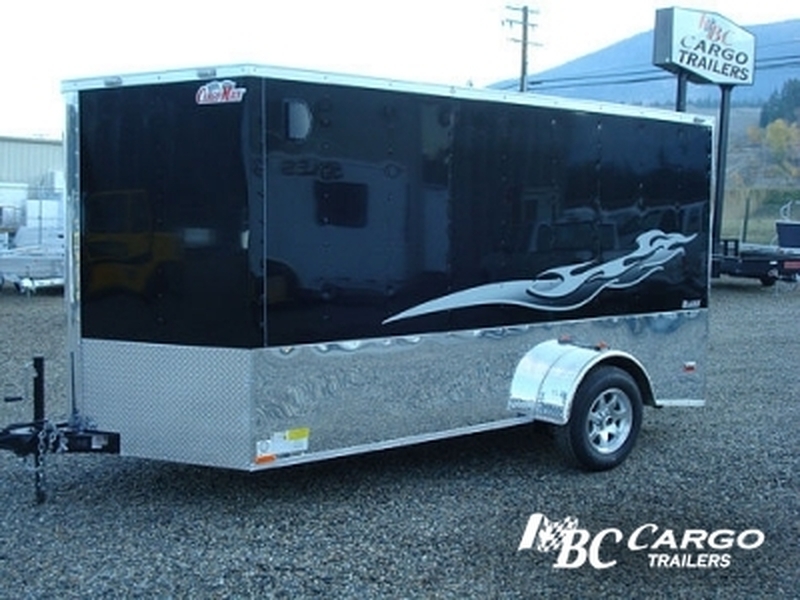 A Wide Range Of Options Are Avaliable To Add To Or Modify The Exterior & Interior Of These Trailers. For Enquires, Please Call Us And Our Sales Team Will Assist You With Available Options. The all NEW Mega Ramps are Strong and light. When closed, the Big Tex Mega Ramps give you a full deck space to use for Additional Cargo. Mega Ramps are double springed to allow them to be easily lifted and used. The 1/8″ diamond plate Ramp operates with an innovative Double Action spring system which allows the end user much more Versatility. Suspendisse feugiat tellus in erat volutpat, ut viverra lacus rutrum. Nullam vitae ante fringilla, posuere augue a, commodo orci. Praesent mattis, lectus eget suscipit semper, sem dui placerat lectus, ac pretium erat augue eget dolor. Fusce pretium ut quam et pretium. Mauris id molestie nisl. Cras sollicitudin ante lacus, quis placerat urna tempor sit amet. Ut tincidunt metus eget mi facilisis, pharetra volutpat sapien consectetur. Nunc vehicula, sapien ut gravida mattis, lorem est sollicitudin diam, non placerat dolor tellus vulputate dolor. Sed at eleifend est. Check out the NEW Mega Ramp design by Big Tex Trailers. The Mega Ramps are 44″ wide and when closed, give you a full deck space to use for additional Cargo. Mega Ramps are double springed to allow them to be easily lifted and used. The 1/8″ diamond plate ramp operates with an innovative double action spring system which allows the end user much more Versatility. By piercing the crossmembers through the main I-beam frame of all Big Tex gooseneck and heavy equipment products, these models have a lower deck height than traditionally manufactured trailers. 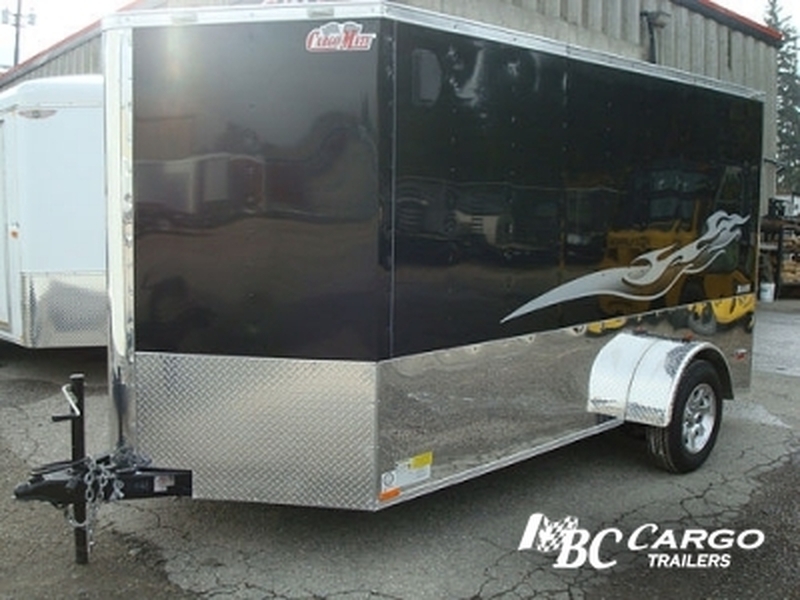 This lower deck height allows the trailer to have a lower center of gravity, therefore creating a smoother pulling trailer behind the tow vehicle. The pierced crossmembers also created a more rigid frame structure that adds strength and longevity to the trailer. Center Pop-Up Dovetail The Big Tex Center Pop-Up Dovetail is a great option for adding versatility to your trailer. When in the closed position, you can load your trailer just like a standard dovetail, but when popped up, you instantly gain an additional 5′ of cargo area. The center pop-up dovetail is spring loaded and is extremely easy to use. Big Tex Trailers is now proud to offer our best in class Knee Ramps, now available on the ET series model. 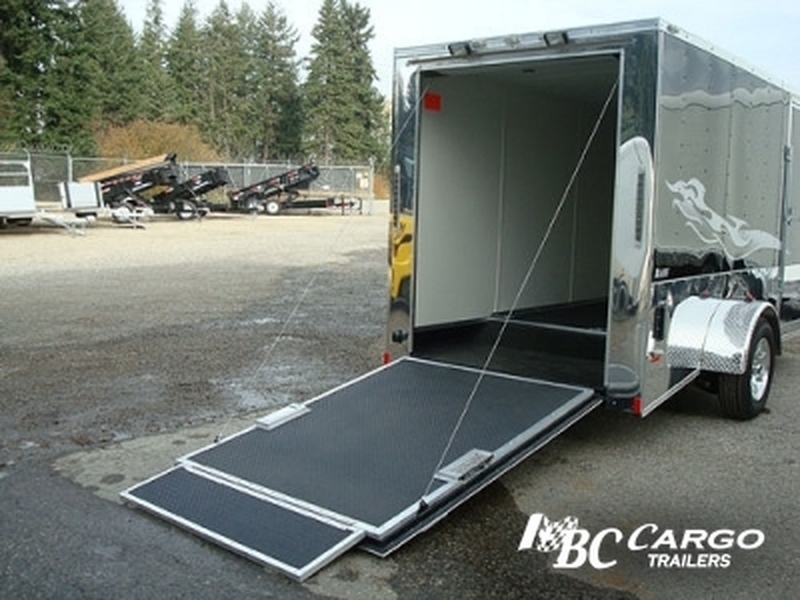 •Quality-made ramps measure three feet tall and 20 inches wide, which reduce wind drag while our customers are towing. •These easy to use ramps are more versatile for any hauling job, allowing you to haul a wide variety of equipment due to their low loading angle and wide track design. •Made with a structural C-Channel Angle, Big Tex’s knee ramps are stronger than our competitors’ stand up ramps. Big Tex brings a whole new meaning to HD by featuring a Heavy Duty Adjustable Suspension on all models with a GVWR of 23,000# or higher. This suspension is rated for a higher capacity and is also fully adjustable if the trailer were to get out of alignment. Tough work calls for tough trailers, that’s why Big Tex utility trailers are equipped with pipe top rails. The top Rails keep your trailer Square and allow them to hold up, through the Rigorous test that our customers put them through. Safety is something that we keep in mind every day at Big Tex Trailers. When you look at our lighting, you will notice that we use the safest lighting in the industry, LED lighting. This lighting is brighter, more dependable, and uses less power from the tow vehicle. Furthermore, LED lighting lasts longer than conventional incandescent light-hands down! The Scissor Hoist is the premier hoist system for commercial applications. When using a scissor hoist, the lifting pressure is spread over a wider surface area, less stress is placed on critical frame locations and is more efficient at lifting the bed. The wider base of the Scissor Hoist also makes it much more stable for raising and lowering of shifting or uneven cargo. Ever used your battery to the point that there was no charge? This plug allows you to charge your battery faster and from the dead state, without placing the battery on a separate charger. By law, many municipalities require that dump trailers be outfitted with tarps. Our dump trailer tarp kit option helps ensure that your aggregate and/or cargo stays where it belongs until you decide otherwise. These trailer tarps are constructed of high-grade mesh and provides years of reliable use. These ramps are stored in pockets at the rear of the trailer for easy use. Structural channel is used in order to provide a strong and durable ramp. When it comes to trailers, Big Tex has designed the industry’s best tongue anywhere. They utilize channel to Reduce Condensation and Rust in the tongues to ensure that the tongue on your unit will not flex or fail when loaded. The Channel is Stronger and Thicker than many tube steel tongues in the marketplace. Hydraulic dampening cylinder makes tilting up and down smooth and easy. The bed is cushioned as it gently comes to rest using a hydraulic dampening cylinder. Convenient, low maintenance tilt equipment trailers with no ramps to move, simply unlatch, tilt, and load. The heavy-duty, high-strength, fabricated steel construction and user-friendly, height-adjustable design of this square, gooseneck coupler make it the best for your towing application. The barn doors are also great for dumping bulky loads like firewood, scrap metal, and brush that could get jammed when using the a spreader gate. Hydraulic pumps and batteries inside of a locking toolbox. This protects the hydraulic system from damage while also securing these high value components from theft. A 16"-24"” high checker plate sheet, notched to fit the A-frame provides long lasting protection, and an attractive aluminum finish to the trailer. Lubrication points located on the ramp hinges in order to keep lubricated and moving freely. This license plate holder is made from durable, black molded plastic and measures 14-1/4" long x 8-5/16" wide x 13/16" deep. Two screws included secure the license plate to the holder. 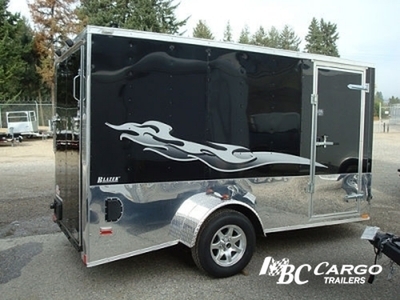 Stylish and classy rims go a long way in increasing the look and Appearance of the trailer. These Powder coated silver Mod Wheels do just that. Get the ventilation you want when you want it. Heavy-duty steel base with transparent, white, all weather butyrate dome. Vent measures 14" square and has a dome which admits light into the cargo area. 5000 lb capacity recessed D-rings mounted into the floor of the unit. Extra strength to provide extra safety for your load. The Beaver tail reduces the ramp angle significantly and produces a safer and easier ramp angle to load vehicles with low ground clearance. It also increases the door opening clearance height an additional 4"
By adding the optional front Ramp Door, you open up a whole new level of Versatility with Drive-off Unloading for Motorcycles, Snowmobiles,ATV's..... whatever your Power Sport vehicle may be. Come in pairs for air flow through the trailer. these vents are fixed open to allow constant air flow. 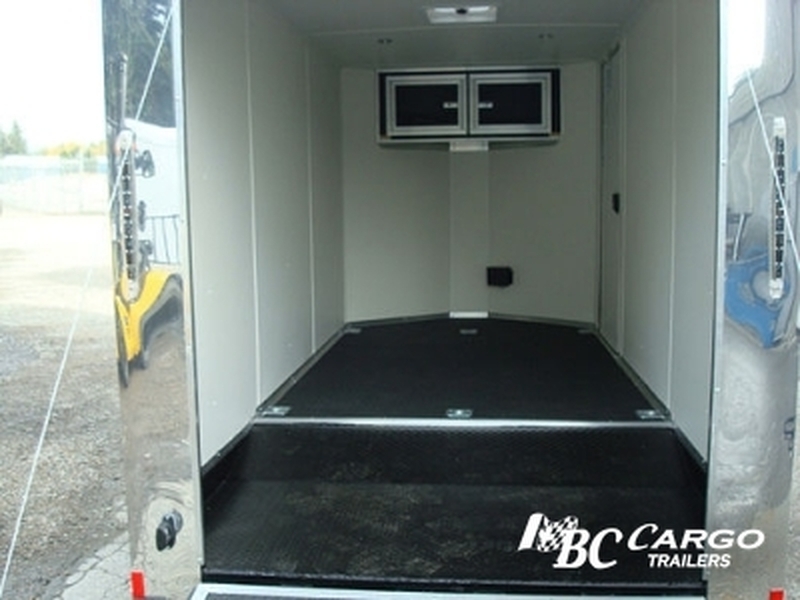 Comes with your choice of a Rear Ramp Gate or a Double Swing Doors allowing the easiest access to load your Cargo Trailer. 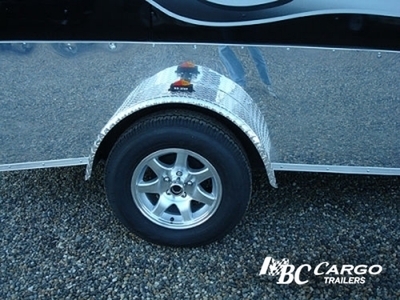 You may choose to dress up your trailer with aluminum wheels to give it that custom look. 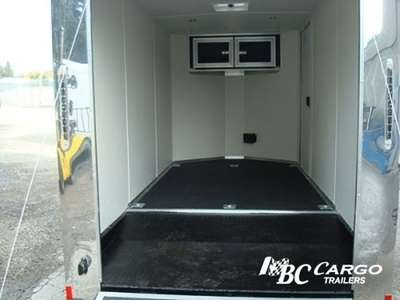 Provides a lower approach angle and adds more interior clearance for the rear ramp door. The fold down stabilizer jacks give stability to the rear of a trailer when loading. For added security the freezer latch gives you this and more. Rub rail includes both stake pockets and pipe spools on 12" centers. These give you almost unlimited tie down points, while also strengthening the rub rail. The gooseneck trailer is equipped with two drop leg jacks that are spring loaded, saving you time and energy. When parking your trailer you simply pull the foot pin and press the jack foot to the ground, instead of having to crank to lower the jack foot. The spring loaded foot also quickly retracts to the up position to save even more time and energy. Comes equipped with front side steps on both sides and handles connected to the bumper gusset. This makes climbing on to the trailer deck a simple and safe task. Gooseneck trailers all have 12” I-Beam neck and frames to give you the strength you need to haul your heavy load. Whether you are hauling backhoes, skid steers, tractors, or heavy pallets, a Big Tex Gooseneck is designed to get your load to the job site safely, without fail! Equipped with an impressive 12” I beam frame for all out strength and Durability. As well it also increases the structural rigidity of the trailer when it come to all out hauling. Diamond plate wheel wells are both strong and functional This allows the deck to be as low as possible without sacrificing deck strength. These ramps are stored in pockets at the rear of the trailer for easy use. Structural Channel is used in order to provide a Strong and Durable Ramps. The fender guard protects against the unexpected and will keep your fenders looking good as new for years to come. This is all done without sacrificing payload space. The Rub Rail adds not only protection to the trailer along the side but also provides Multiple Position tie town points to secure your load. These give you almost Unlimited tie down points. The fenders are heavy gauge diamond plate steel for increased durability. They can also be easily removed for off-road use or easy replacement. Not only are diamond plate fenders tougher than the typical smooth plate, they also look tougher. These fenders are stylish and functional. They can be easily removed for off road use or easy replacement. Increases traction when loading & unloading. Provides for easier access to trailers that sit higher off the ground. These Sturdy steel D-Rings creates a Stable & Secure tie-down point within your trailer for securing Atv's, Utv's and other Cargo you may haul. Secure anchoring points in which to fasten your cargo or what ever your power sports may be. The Tarp is mounted underneath the tarp Shroud offering Protection from Material being loaded. Heavy duty anchor points used to secure your equipment to when hauling it. These couplers are height adjustable to allow you to level the trailer with the towing vehicle. 7 way plug that comes from the trailer harness. Not only stylish, but it protects your power sports from road debris and convenient for loading and unloading your machines. Used to secure the front ski's while transporting your snowmobiles. Great addition to your cargo trailer. You can get shade during hot days or protection during rain with RV awnings; as a result you can still sit outside without being affected. Great for those heavier applications where you need more stability when loading. Great for Trailer Door or the body of the cargo trailer. 4-way flat connector is designed to provide the electrical connection between the towing vehicle and the towed trailer. The sealed modular wiring harness protects the wiring from water, dirt, and corrosion. Sealed wiring is protected from the elements, an since the harness is modular, repairs or replacement if ever needed are easy. 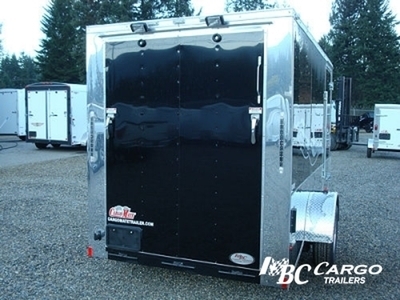 The split ramp gate option give the trailer a little more versatility for the user. The Aluminum Wrap on the rear is not only for protective purposes but stands out and gives the trailer a great look. When you want to add a little more bling to your trailer. The appearance package consists of 6" aluminum tread plate on bottom of trailer.... Aluminum Tread plate front corners & also an Anodized Rear Hoop Wrap. Used for securing the Motorcycles down to. 2" Formed Tubular Stop Rail is to assist you when loading your Equipment. The Heavy Duty 12k spring loaded, jack saves you time and energy. When parking your trailer you simply pull the foot pin and press the jack foot to the ground, instead of having to crank to lower the jack foot. The spring loaded foot also quickly retracts to the up position to save even more time and energy. Clearly the best option in the industry in axles, Dexter combines quality, value, and consistency far above any other axle on the market today! Great anchor points on the outside of the trailer for fastening straps or tarps to. High Quality White Spoke Wheels to dress up the trailer. These ramps are great to load your Atv's or Utv's and Can Be Used On Either the Sides or Rear when loading. They are 16" wide and 5' long so they making loading a breeze. 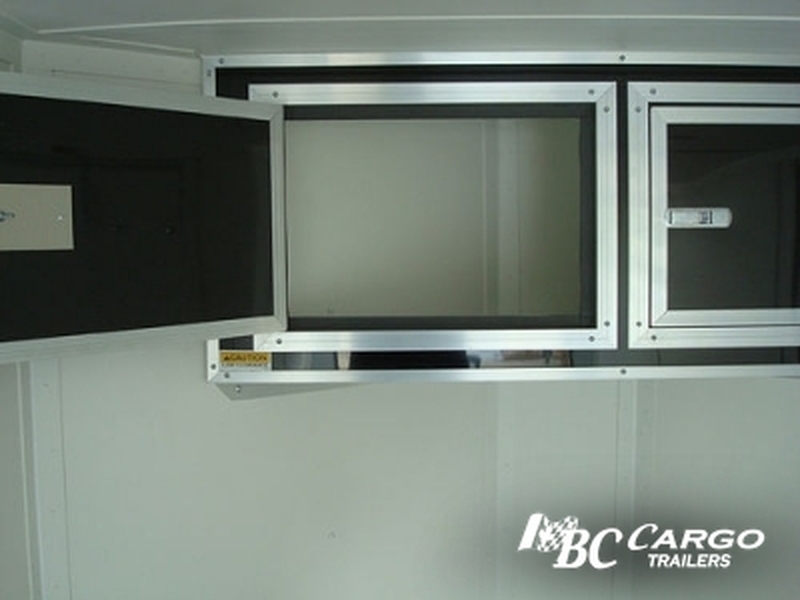 The Overhead Cabinet with its Aluminum construction is both Light Weight and Attactive. It works great when it comes to storing Helmets or Gear that you want to take along with you. Stainless Steel Storage Rack for Gear 48"
Stylish and Sleek looking, these Snake Eye Clearnce Lights really make your cargo trailer stand out. They are both Attractive and Functioal. LED lights draw less Power from the lead vehicle then incondescent lights and last much Longer. Stylish and Sleeker looking then the tradional red oval lights, these Clear Lens Strip Lights really make your cargo trailer stand out. They virtually blend with trailer and do not become visible until actuated. They are both attractive and functional. LED lights draw less Power from the lead vehicle then incondescent lights and last much Longer. 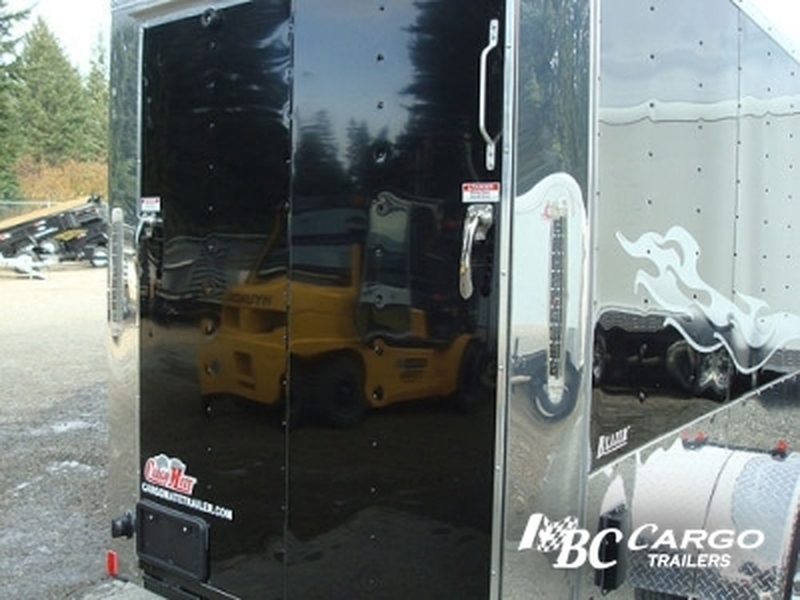 This cam latch lock side-door bar lock assembly is perfect This cam latch lock assembly provides a secure way for you to lock your cargo trailer. 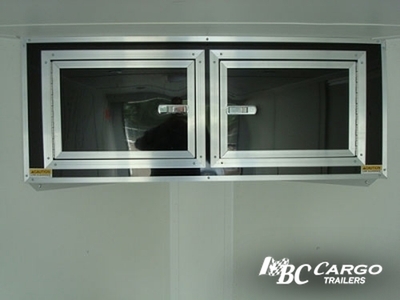 An RV Door is an Insulated door that has more mass to it and gives you a more Solid Door. It also is fitted with an RV lock which allows you to lock it both from the Outside as well as the Inside. 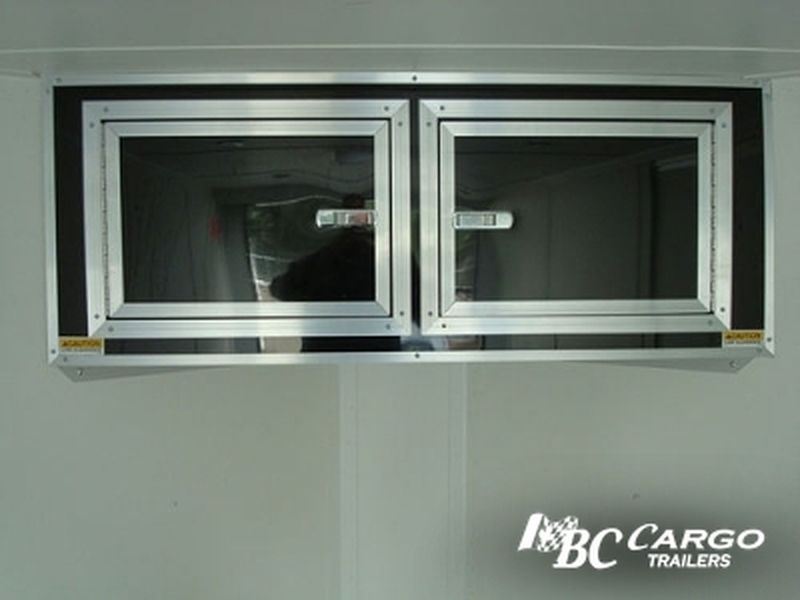 Not only does this provide Extra Security for the Cargo Trailer from the Outside but it allows you the option to stay Inside the trailer and Lock the door from the Inside! The Safety-Chain is an added extra touch. 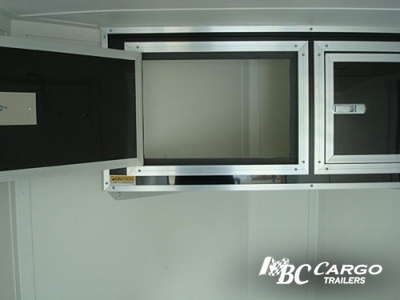 It prevents the door from slamming into the trailer when opening the side door in not so favoratable conditions. When you upgrade to an RV Door double your Security with both an RV Lock and a Camber Bar Lock Kit combo.. The Spring Assisted Gate takes the strain out of lifting and lowering a utility trailer gate. This reduces wind drag, improving fuel economy when towing the trailer empty.. Another added benefit is the ability to haul over length cargo such as lumbers and ladders. ** Skid resistant under both wet and dry conditions. ** Protects subsurface from oil, solvents and grease. ** Washable with soaps, cleaning agents and pressure washers. ** Maintains a "like new" look longer than treated wood. Built with AdvanTech® flooring for award-winning performance you can rely on. Specifically engineered to combine industry-leading strength & superior moisture resistance. Highly Compressed Material.... High panel density helps reduce water absorption into the panel, even under harsh weather conditions. The Removable 5' fabricated ramps are sure to assist every time with the loading. They cradle on the side of the trailer and act as part of the side rail.